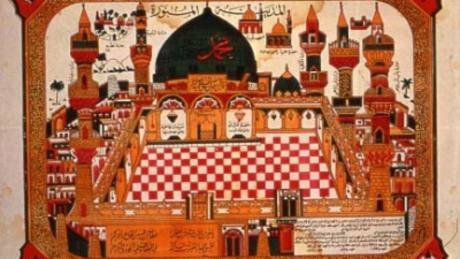 Drawing of tomb mosque of Prophet Muhammad in Medina, Saudi Arabia. Text in Arabic. Serves as souvenir of pilgrimage to mosque of Muhammad in Medina, includes spaces for names of witnesses attesting to completion of pilgrimage – 3-6-2011 (Hoover Institution Archives Poster Collection/Fair use. All rights reserved to the author].This series of opinion articles on the relationship between secularism and authoritarianism is the outcome of a collaboration between SyriaUntold and openDemocracy’s NAWA]. When we speak today about a secular interpretation of the Prophet, the issue at hand isn’t Islam in its destined eventuality, but rather Islam in its genesis, at the moment of its inception and emergence on the historical scene. Interpretation is therefore not a search for novel meanings to be devised and attached to the old faith as a cosmetic accessory. It is rather an attempt to discover its original meanings, and to trace their transformations and destinies. That is, to discern what has come “first,” and to handle it as malleable and susceptible to interpretation. The conception of secularism has developed in a prolonged and convoluted historical path, like a sprawling tree with far-reaching twigs. This conception has been so diversified that it often implies multidimensional, ambiguous and contradictory notions. However, as we trace the branches and twigs, we would arrive at the tree trunk, political secularization (regardless of its gradations), and the root, intellectual secularization (regardless of how radical it may be). Accordingly, the question arises of whether the secular interpretation of the Prophet is going to be politically or intellectually secular? The answer is both, politically and intellectually. The earliest symptoms of intellectual secularization were manifested through the Prophet’s position on the sources of truth, which he didn’t limit to revelation. In addition to the Divine source, he referred to the soul trails and spiritual experience within the realms of intuition and feeling, rendering man himself the witness and the judge: “Man shall bear witness against himself” [Qur’an 75:15]. Other sources of truth include roaming the world and contemplating past experiences of mankind — what we call history — as well as looking upon nature: the land, the sky, and the cosmos. Followers of the Prophet would soon venture with this spirit of intellectual secularism to transform astrology into astronomy. The position of Prophet Muhammad was similar to that of western scholars who were subject to nefarious inquisitions. We know that the concept of intellectual secularism in Europe has only crystallized through questioning the sources of truth, the path to it, and the means with which to verify it. The attempted answers would soon generate a bitter struggle between the Church, whose source of truth was confined to what’s in the Bible, and scientists, who considered the “Book of Nature” as equally authoritative. As noted by José Casanova, the conflict between the church and the new science, symbolized by the trial of Galileo Galilei, “was not about the substantive truth or falsity of the new Copernican theories of the universe as much as it was about the validity of the claims of the new science to have discovered a new autonomous method of obtaining and verifying truth. […] Thus, the attempts of all the pioneers — Galileo, Kepler, and Newton — to enthrone the ‘Book of Nature’ was a legitimate, separate but equal, epistemological way to God, along with the ‘Book of Revelation’[i].” The position assumed by the scientists of the renaissance was very similar, if not identical, to that of Prophet Muhammad. As for political secularization, its symptoms were manifested through the Prophet’s insistence on the principle of separation of powers. Returning to the first, unmistakable meaning in the Prophet’s persona, we would notice the diversity of the Prophet’s worldly decisions, in accordance to the multiple manifestations of his prophethood. We would also notice that the Medina era was more appropriate for these manifestations to be demonstrated. In Mecca, he mostly played the role of the Prophet, whereas in Medina he went on to play three major roles: Muhammad the Prophet, Muhammad the Judge, and Muhammad the Leader. That these three roles were distinguishable is at the very core and heart of secularism. It is perhaps in this point that Prophet Muhammad is different from Jesus Christ. Jesus didn’t achieve a standing as high as to put into practice a separation of powers, although he did call for it – his message could be likened to Muhammad’s Meccan era. Although most Islamic scholars have noted this separation of powers, they didn’t go as far as to render it a fundamental basis of Islamic governance, where it would be doctrinally rooted, culturally promoted and ultimately considered a binding principle with clear legal foundation and implementable laws for rulers and sultans. In sum, the Prophet has always delineated when he acted as a mufti, when as a leader, and when as a prophet, without any of these manifestations interfering with, prevailing over or exploiting the other. He upheld and exhibited the principle of separation of powers, especially the separation of his religious authority from other authorities. Seeking to explain to the west the overwhelming reaction that swept the Muslim world following the publication of Salman Rushdie’s ‘The Satanic Verses’ (1988), German orientalist Annemarie Schimmel (1922-2003) wrote her book ‘And Muhammad Is His Messenger’, in which she explores some aspects of the love and reverence Muslims have for their Prophet. Based on rigorous examination of books written in Arabic, Persian and Turkish, Schimmel details the works of many scholars and poets who have demonstrated tremendous love and infatuation with Muhammad. She dedicates an entire chapter for poet Muhammad Iqbal (1877-1938), whose poetry exudes an exceptionally overwhelming and most profoundly rooted love for the Prophet. Indeed, the philosophical roots of secularization in Christendom could be traced to Muslim thinkers, most notably Andalusian philosopher Averroes. The dispute over his legacy in the 13th century, or what was called the suppression of Averroism, sparked the beginnings of an intellectual secularization movement, centuries before political secularization. Turning to Muhammad Iqbal, do we find a work or position by him encapsulating a practical application of his aforementioned understanding and analysis? Yes, we do, and astoundingly so. This Muslim thinker, who was brimming with religious zeal and pride, and who referred to Islam as the greatest means of rationality and balance for humanity, has been among the few Muslim figures to show understanding of the abolition of the caliphate by Mustafa Kemal Ataturk. Moroccan PM Dr. Saadeddine Al-Othmani, one of the country’s most prominent Islamists, has authored a few years ago a book entitled ‘The Prophet’s Behavior With Regards to the Imamate’ [‘Tasarrufat Ar-Rasul Bil-Imamah’ (2002), available in Arabic only]. Al-Othmani’s text is actually an Islamist case for secularism. Regardless of the author’s secularist intentions or lack thereof, the diversity of the Prophet’s actions, between being a prophet, a judge and a leader, leads only to this conclusion. However, the long historical experience of rulers and politicians, and the immense intellectual efforts made by their cohorts against secularism, have produced but one understanding of the Prophet. Regrettably, he has been rendered exemplary of the integration rather than separation of powers, and his misinterpreted actions have become the justification for an opportunistic and demagogic conflation of them. A Muslim ruler’s first and foremost concern is entrenching his grip over all authorities without defined boundaries. Even those who claim to be secular rulers maintain all powers as intertwined, muddled and deformed, where one could hardly find a distinction between the executive, judicial, legislative, political or religious authorities. They are all rendered theatrical puppets, lulling us at times and terrorizing us at others. Since the French Revolution, Christianity has managed to rationalize secularism, initiate a secular interpretation of its faith, thus resolving the secular-religious debate once and for all. It only required one biblical phrase that doesn’t exceed half a line: “Render unto Caesar the things that are Caesar’s, and unto God the things that are God’s.” Meanwhile in the Islamic world, secularism is still approached haphazardly, and so is the principle of separation of powers. Instead of exploring the vast potential available to us to interpret Islam and its prophethood secularly, with much less artificiality and arbitrariness, we have preferred to remain woefully steadfast and unyielding. [i] José Casanova, Public Religions in the Modern World (Chicago, University of Chicago Press, 2011), 25. [ii] Muhammad Iqbal, The Reconstruction of Religious Thought in Islam (Stanford, Stanford University Press, 2012), 100-101. [iii] Alija Izetbegović, Islam Between East and West (Calicut, Islamic Book Trust & Other Books, 2013), 193.